This Premier Ranges 36 Inch Gas Range comes with 4 Open Burners with Electronic Ignition and a 3. 9 cu. Ft. Manual Clean Oven. This premier range comes with a 4 inch porcelain back-guard and uses Electronic Ignition. All Premier Gas Ranges can be used with Natural Gas or LP without buying conversion kits or any other extra parts. Premier Gas Range has a porcelain finish top that makes cleaning much easier. It also include heavy duty grids with porcelain finish. 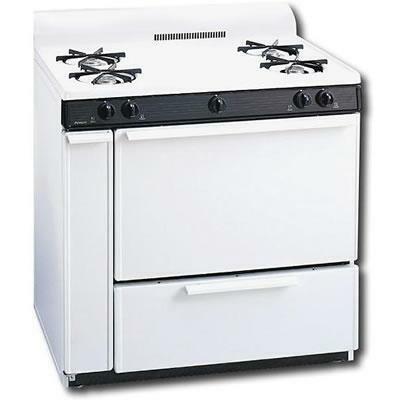 This Premier 36 Inch Gas Range comes in a very attractive White with Black Trim perfect to compliment your kitchen.